The Peregrine Falcon is the fastest bird known to man. At speeds approaching 200 miles per hour while diving, it surely deserves its title. 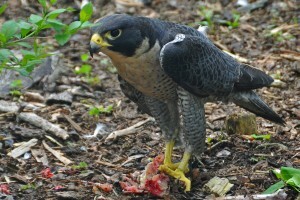 This may seem surprising for a bird about the size of a simple crow, but the falcon accomplishes this feat by tucking its wings into its body,reducing its angle of attack–the angle between the resultant relative airflow on the falcon’s wing and a chord going through a cross section in the falcon’s wing–and thereby reducing its drag coefficient to .18. The lower the drag coefficient, the higher the speed the falcon can attain. The Falcon’s weight also contributes the maximum speed it can attain. In addition to its low drag coefficient, the peregrine falcon has powerful chest muscles and a long wingspan ranging from 1 to 1.1 meters. 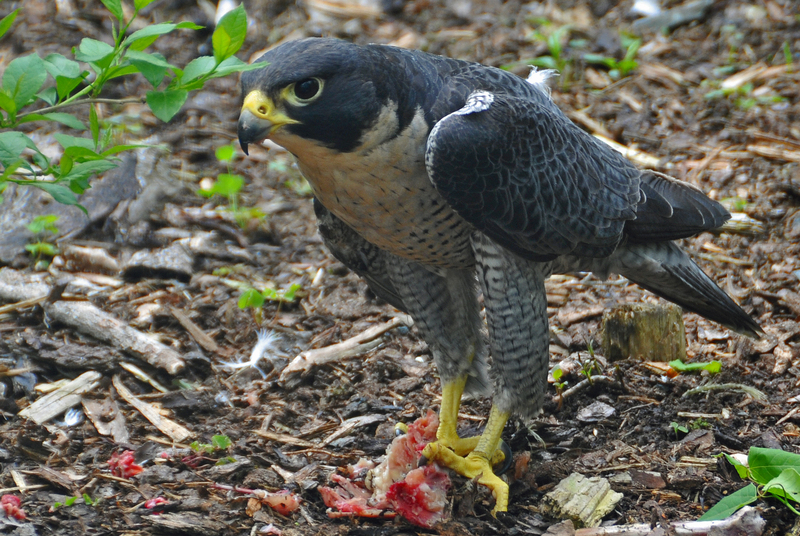 The peregrine falcon dives in order to catch prey, and not just prey it sees on the ground. The falcon clutches other birds such as pigeons, European starlings, and ducks in mid air while it dives at extreme speeds. The peregrine falcon not only reaches these extreme speeds, but it reaches them fast. Diving straight down a 1 kilogram falcon can reach its maximum speed after 16 seconds, traveling a distance of 1140 meters or .70 miles. Diving at an angle of 15 degrees to the horizontal, the falcon can travel 322 meters in 38 seconds. Its clear that the peregrine falcon has extreme control in addition to its ability to reach its high speeds. In order to slow down after diving at about 200 miles per hour, the peregrine falcon can increase its angle of attack and increase its drag. It increases its drag by generating lift 18 times its weight through reducing its wingspan. The key factor though in slowing down the falcon is how it converts this lift into drag. The way in which the falcon reduces its wingspan redirects the lift in the same direction as drag. This is what slows down the falcon dramatically. After traveling with such high velocity the falcon only needs 60 meters to pull out of a completely vertical dive. In the following video, a Peregrine Falcon is studied that dives at 183 miles per hour, also about 82 m/s. It dives straight down at an angle of 90 degrees for 9000 feet, reaching its maximum speed less than halfway into its descent. In another test, the falcon clocked in at 204 miles per hour, or 91 m/s. Although impressive, you showered us with data here, without giving some perspective or comparisons that would help make sense of it. I can see that you took a lot of facts from the (highly technical, as I warned you!) paper I recommended in Piazza. It would have been nice to pepper this with more accessible parts in the piece.